The color of a pallet remains an important consideration for any pallet pool. Just ask CHEP or other pallet and reusable packaging pools around the world that utilize specific colors to promote better control of their inventories. Pallet pools use a variety of basic pallet colors, as is outlined later in this article. While a variety of automatic identification strategies have emerged that can provide more information about a specific pallet or load, pallet and container color remains an effective measure for control and quality assurance. In addition to assisting in control, pallet color can be an important component of other marketing or quality assurance initiatives. More on these items below. So why choose a specific color for your pallets? Pallets can be spotted at a considerable distance by asset managers when they are a specific color. Likewise, color coding helps facilitate warehouse pallet audits, even in high rack location. Color marking of pallets enables material handlers to easily sort different types of pallets and helps ensure that employees use the correct pallet for the correct shipment. Pallet color coding can be indispensable in helping plant employees segregate one type of material from another, where certain materials or processes are associated with a specific color. Color coding can be used to also reduce the risk of cross-contamination where some pallets or totes may be used for unhygienic applications. And of course, pallet color selection can help in retail marketing and store esthetics initiatives. 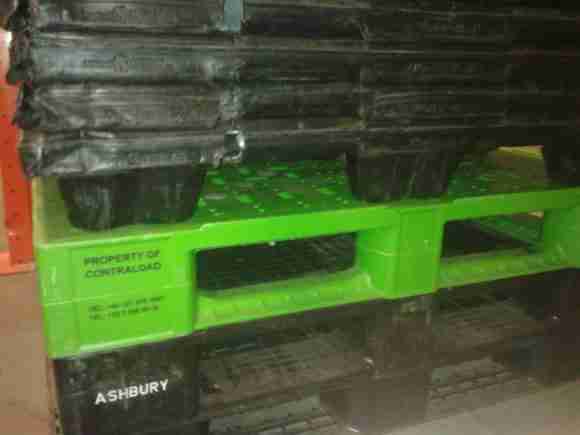 Color coding may add extra cost to the pallet or container in some cases. When color coded assets are assigned for certain applications only, this may limit the utility of the asset to use for other applications, which may evolve over time. Flexibility may be lost. There may be confusion if the same color is used by different pool pallets. A number of considerations go into selecting a pallet color, including UV resistance, scuff resistance, differentiation from other competing products, marketing and esthetic values, and last but not least, relative cost. Here are some of the pallet colors that one often sees in the field, depending upon the part of the world being considered. The future of color markings is unclear as Auto-ID technologies such as RFID continue to find acceptance. It seems likely that to the extent that Auto-ID technologies are fully integrated into a reusable pallet application, pallet color will be less important in the future than today, but for now, the choice of color for pallet pools remains an important tool for pool managers and pallet users alike.